1. Mix the bottle with a half and half combo of baking soda and cornstarch. 2. Add in the food coloring. 5. Have fun all over the drive way! This kept her quite busy! 6. Last we used the bottle of vinegar and squirted it over the chalk paint and it erupted and sizzled! It washed right off the next day in a rainstorm! I am at a serious impasse here! My mother in law found this, I think it was an old mirror frame that the mirror has broken out of. But she liked the shape and so do I, but I have no idea what to do with it! I have a big blank wall in my dining room and tons of ideas, but I am not sure what I want here, and it is driving me crazy! Maybe next week I will have finished it and have something beautiful to show for make something Monday! We have been having a blast this summer, baking, field tripping, our walks... It has been glorious. I am very sad to say that it is almost half over. I know, What??!! We have done the park, lots! Jumped around a monkey business! Girls day! We dressed up like princesses and saw a princess show at the art school and had a ladies lunch! Got flocked by the youth group! They are raising money to go on a mission trip to Honduras and they "flock" your yard and you can pay to send it to another family's house. So fun! Watched movies and played at home! We have been having a blast, I can't wait to see what else the summer has in store for these crazy kids! I have the sweetest little girl! She is always finding ways to help others. At home she has dazzled us with her patience and love for Kellen, even when he cries and pulls her hair. There is just something about the way she looks at him that makes so proud of the girl she has become! When we go for walks she says hi to everyone we pass and tells them have a great day, she is always concerned when someone is upset about something and she is so quick to offer a prayer on someone's behalf. A few weeks ago for thoughtful Thursday, Callie wanted to do something special for the mailman. My dad, her papa John, is a mailman and he is full of stories of kiddos bringing him lemonade on a hot day or a cookie for a snack. So Callie rummaged through the pantry and made a trail mix and wrote the sweetest note for our mailman and left it in the box for him to find. I know you have an exhausting job. I know because my papa is a mailman. PS- Do you know John Wathen? He is my papa. Yesterday we did thoughtful Tuesday...Because we were crazy with VBS stuff and we didn't get to do something nice for someone on Thursday, we made it up for it. Callie saw this on pinterest where a family put together bags of change and taped them to vending machines at the local hospital. She loved this! The only thing was, that we didn't get to see peoples reaction to her nice deed. So that morning she took all of the quarters out of her piggy bank and put them the plastic bags with little notes that said things like: " Enjoy something from the snack shack" Or " free money, God loves you"
Then we loaded up and went the closest hospital. I have only been to this one once when my grandpa had a heart thing a few years ago, so I was not super familiar with the hospital. We wandered around looking for vending machine and couldn't find one, we found the cafeteria and coffee cart, but no vending machines. So we hopped on the elevator with a nice doctor and he asked us who we were visiting. Callie said we were looking for the waiting room to do nice things for people. He explained the layout of the hospital and said good luck and I felt way less creepy. So we stopped at every vending machine we could find and left our money bags. Callie loved it! Changing the world with a bag of chips! Pluck grapes from their stems and rinse in a colander. Pour the gelatin mix onto a plate. 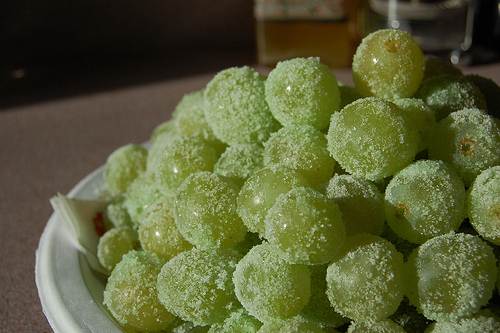 Place grapes on the plate one handful at a time and roll around until coated. Transfer to a pretty dish and refrigerate for 1 hour to allow the gelatin to set. So easy right? Wrong. We used sugar free jello which just makes gross clumps when it gets wet. But Callie found a box of regular Jello in the back of the pantry, so we rinsed the grapes and started over. The regular jello coated a little better. We stuck them in the fridge to enjoy after we got home from VBS. They were horrible, sour, hard and crunchy. I will never make this again. They did not taste like candy, they tasted like poison! They were gooey and sour, Blech!! It felt like eating raw meat, seriously that was the texture. Yuck! Don't ever make these either. The moral of the story this week is: Don't mess with fruit!! It's good just the way it is, don't change it or add to it, unless you want something gross, so there. Flowered shorts: Thrifted, Target, brand new with tags! I wore this to time to read Tuesday! It was super comfy! I wore this to church, great for working in the nursery when you have to be up and down and all around. I wore this to the Kellie Pickler Concert (or Kellie Pickles as Callie calls her) It was super fun to get out of the house sans children and have night of dancing and good music! Dress: Thrifted, Old Navy, new with tags! I wore this last week with my dad on errands to pick up our new window well, you would never guess how hard those are to get if you are just a regular Joe off the street! These were the short shorts in questions... I wore these to shop for house stuff. I am currently on the look out for new pillows, stuff to make a family calendar/message wall, picture display and frame ideas and stuff to decorate the laundry. No such luck so far! Kellen is 9 months old! You eat all day! Anything you can get your hands on. Puffs, yogurt, veggie things, you are constantly hungry and waiting to be fed. We have a sort of routine, you get up anywhere from 7-8, then we go for a walk, you demand your second breakfast. Then we run errands, back for a nap, playtime, lunch, a little cat nap, second lunch, more play time, dinner, playtime, bath and bed! You are Jake are BEST FRIENDS! I think he just follows you around in hopes of food or drool, I guess it's his reward for not eating you! He even lets you use his toys and doesn't try to bite your fingers off! You are in all out crawl mode! Into everything! You cannot be stopped. You are also starting to pull up on the stairs, your crib and the table. The only problem is, once you are up you have a hard time getting down! Your new favorite thing is to spit all over yourself and others. If it wasn't so gross, it could be cute! I had to include this bomber, you have some funny pictures and I used to delete the bad ones, now they CRACK me up!! Firsts: Family BBQ, swinging at the park, time at Monkey business, swim of the summer, time pulling up, Father's day, time at the library. Things have calmed down greatly, thank goodness. VBS went off without a hitch and now it's over and I don't have to drive to Denver 4 times a day and I have my life back a little. It was a blast and I will definitely do it next year but I am thankful that it's done for now! All of these crazy children had a blast! The decorations this year were AH-mazing! So onto make something Monday! For Callie's craft she wanted to make a t-shirt. It was so super easy and the only thing that we actually needed to buy was a plain white t-shirt. Here are the materials: Fine sandpaper, crayons, a piece of cardboard, paper towel, a t-shirt and an iron. 1. Color your designs on the sandpaper. Make sure that it is super dark and the color is heavy and thick. 2. Heat the iron to the cotton setting. Make sure that you don't use steam! Then put the sandpaper drawing side down on the t-shirt where you want the pattern to go. Put a piece of cardboard between the front and back of the shirt so that the wax doesn't leak through to the back of the shirt. Then use a sheet of paper towel and press the iron down on the picture. 3. Leave the iron in one place allowing the crayons to melt into the fabric of the shirt. Then pick up the iron and press to the next section of the sandpaper. I had to move Callie's like 3 times to make sure the crayon transferred. I let the iron do it's think for about a minute and then I carefully peaked under a corner to make sure that it transferred. 4. Next, turn the shirt inside out and throw it in the dryer on high for about 10 minutes to really set in the crayon. It came out super cute! A new PJ shirt, sign me up! I have washed and dried it already and it still in perfect shape! For my grown up craft, I finally put some old fence to good use. I saw this pin on my sister in law's board and I totally stole it. My mother in law supplied the fence and even made sure that it had 13 pickets for the stripes. It was pretty easy to make. I totally forgot to take pictures along the way, this was a nap time craft and I was in a hurry! All I did was squirt red, white and blue paint on paper plates. Then I filled up a bucket of water. I did the blue first and made a square, I splotched blobs of the paint in my square with an old crusty paint brush. Then I used my water to make a wash and fade out the color for a rustic look. Then I started on the red splotching blobs and blending it in with water. Last I did the white stripes. The stars were a little tricky and up close they are not very pretty or starry looking up. I used a stencil and smaller paint brush, but the pickets are slightly curved so the stars came out a little blobby. I am happy with the overall project, but it is HUGE! I am not sure where to put it, yet. My sister in law said it looks just fine where it is. Who knows where it will end up! End of the school year work binder for kids!